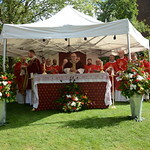 The Archdiocese of Birmingham’s Annual Pilgrimage & 3pm Mass for the English Martyrs in the garden. The Hall is open to pilgrims only. Tours will be available to pilgrims from 11.30am. The event is organised by St. Mary’s Parish. Please contact the Parish directly on 01562 777319 if you have any queries. Please only contact Harvington Hall if you would like to book onto a tour of the Hall. Please remember bring a chair!